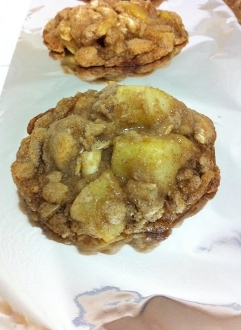 Have you ever had an cookie that tasted just like an apple pie? Welcome to my Apple Pie Cookies. Made with a home made apple compote, white chocolate chip cookies, infused with chai tea with spices of cinnamon, nutmeg, and allspice. Made with 100% whole wheat flour and rolled oats. A huge hit! !